Egypt’s interim government has been sworn in, with army chief General Abdel Fattah al-Sisi, who led the ousting of President Mohamed Morsi, becoming deputy PM as well as defense minister. 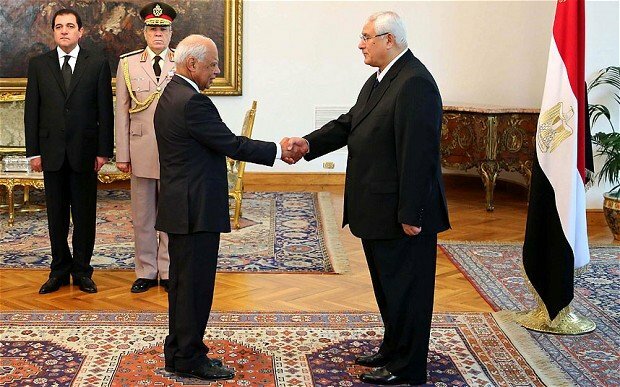 Hazem al-Beblawi is the new prime minister, under the interim President Adly Mansour. The swearing in followed another night of violence between security forces and Mohamed Morsi supporters that left seven dead. A spokesman for Mohamed Morsi’s Muslim Brotherhood called the interim government “illegitimate”. Mohamed Morsi was ousted on July 3 in what many have said was a military coup. The army said it was fulfilling the demands of the people after mass anti-Morsi protests. The swearing-in ceremony was shown live on state television. Gen. Abdel Fattah al-Sisi already held the defense portfolio, but now also becomes interim prime minister. Mohammed Ibrahim, who had been appointed interior minister by Mohamed Morsi, keeps his post. Nabil Fahmy becomes foreign minister and Sherif Ismail is the interim oil minister. Mounir Fakhry Abdel Nour, a Christian, is the interim trade and industry minister. There are three women ministers, including Maha el-Rabat, who takes the health portfolio. There were no posts for any figures from Islamist parties in the new government. The Brotherhood had said it would not take part. The interim government’s transition plan will see a panel formed by next week which will draw up amendments to the constitution and a timetable for new elections. The swearing-in ceremony comes amid continuing deadly violence. More than 400 people were arrested and seven killed in overnight clashes in the capital, Cairo. The battles erupted after protesters, mostly members of the Muslim Brotherhood, blocked the Sixth of October bridge, a major route over the Nile and through the capital, and the nearby Ramses Square, a transport hub. State media quoted health ministry official Khaled al-Khatib as saying that 261 people were injured in the clashes, which lasted into the early hours of Tuesday. Members of the Muslim Brotherhood said security forces had used live ammunition, and accused them of attacking a peaceful protest. On Tuesday, Egypt’s military spokesman, Col. Ahmed Mohamed Ali, denied that the army had used excessive force. The clashes came as senior US envoy William Burns visited Egypt. He met interim leaders but was snubbed by rival groups, including the Muslim Brotherhood. William Burns described the events of the past two weeks as a “second chance to realize the promise of the revolution” that ended the authoritarian presidency of Hosni Mubarak in 2011.